Ashley and I have been so excited for Vegan MoFo this year, we’ve been planning and plotting up a storm. We have a spreadsheet, and a Pinterest board, and way too many text messages about tofu going back and forth! We originally had a complex tempeh plan, and then when I found out Ash had a Mexican scrambled tofu going, we came up with Vegan Breakfast Tacos — soft corn tortillas filled with Mexican tofu scramble, veggies, and salsa, topped with pumpkin & hemp seeds. YES! Scrambled tofu is something I’ve been making since I first picked up ‘How it All Vegan‘ many moons ago. I’ve made it so frequently that I no longer require a recipe and simply go into auto-pilot mode in the kitchen. It reheats brilliantly and is something I can make for one person or 6 people rather easily. I’ve usually stuck to curried scrambled tofu since it’s easy peasy and delicious and have added whatever greens/veggies I have on hand. Whilst getting ready for Vegan Mofo, I was surprised to learn that Linz was a scrambled tofu virgin and knew that needed to change!! 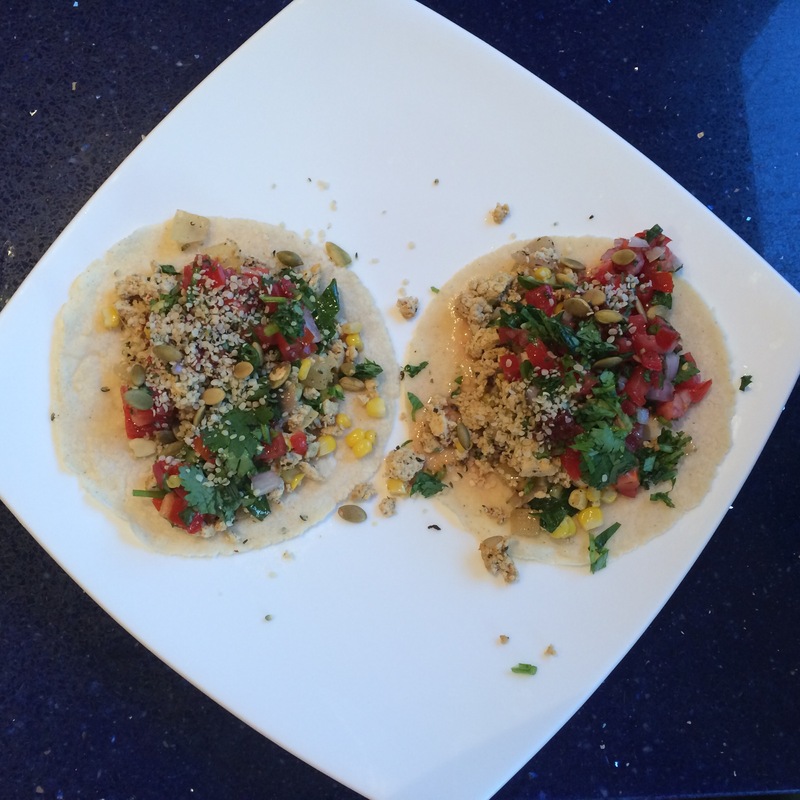 We decided on some Mexican flavours, used the produce we had on hand and created these super tasty tacos! As we sat around eating our Vegan Breakfast Tacos, I couldn’t help but exclaim over and over again how delicious these are; Ash totally agreed. And even Mr. KitchenOperas (the omnivore in the house) enjoyed them & is looking forward to having them again. Success!! 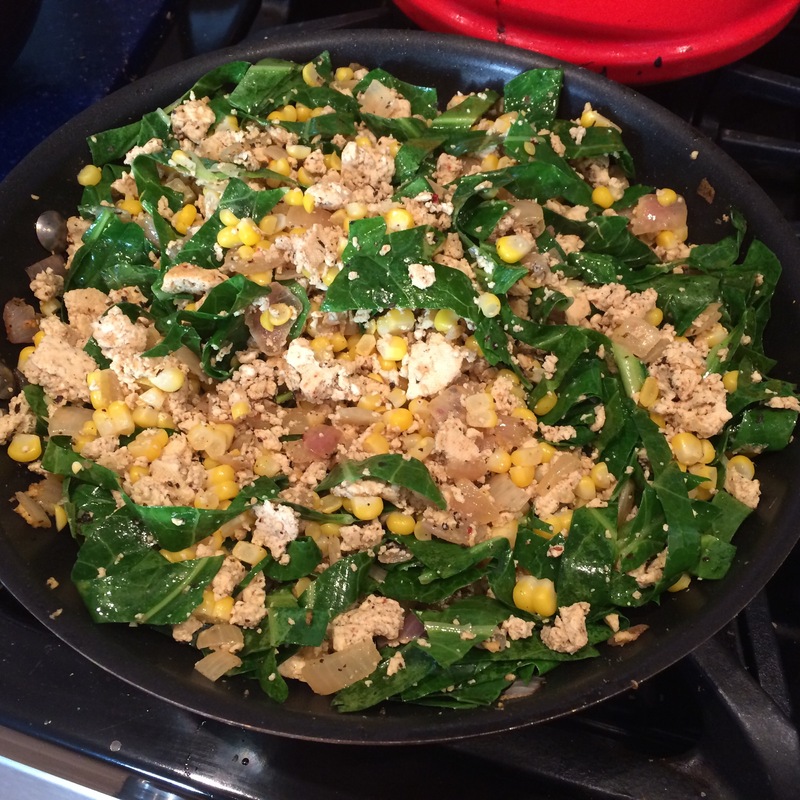 The tofu scramble was way easier than I had expected — it’s a dish I’ll be making a lot more around here. Ashley first cooked the onions and spices, then added the tofu and veggies. We made our corn tortillas from scratch, having fun with my new tortilla press. 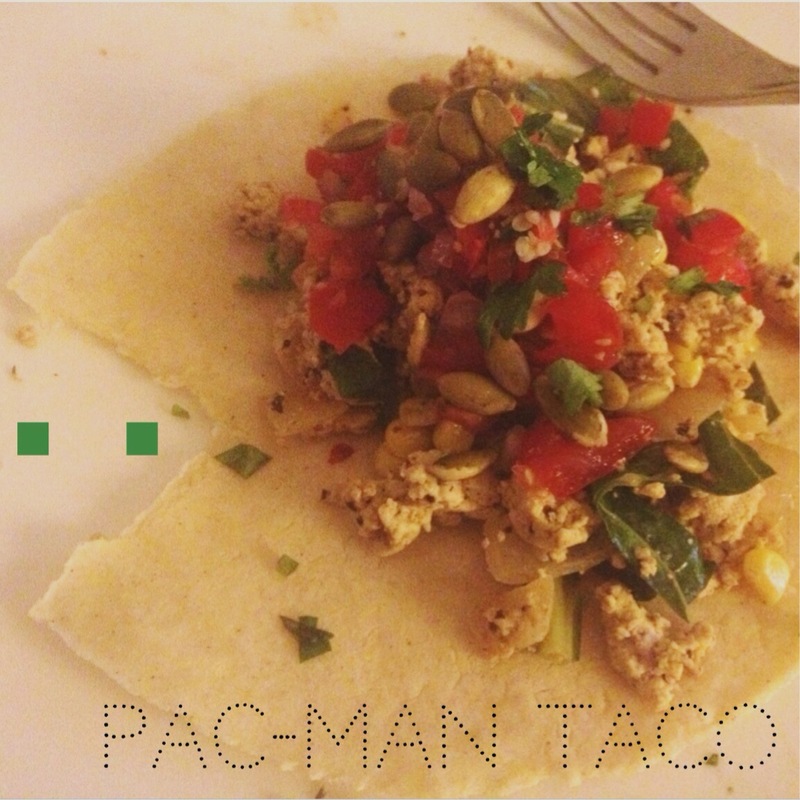 And that means we even made one accidental Pac-Man Taco. Whatever shape your tacos end up — enjoy!!! These tacos are great for breakfast or dinner — the tofu scramble gives protein and flavour, along with the seasonal veggies of your choice. Freshly-made corn tortillas and fresh salsa are a real treat, but you can make them in advance (or buy them!) to speed up your breakfast prep in the morning. Ash and I both liked 2 tortillas for a smaller meal and 3 tortillas for a more filling meal. Feel free to top with slices of avocado and green onion, and maybe a spoonful of chipotle hot sauce. Serves 2. 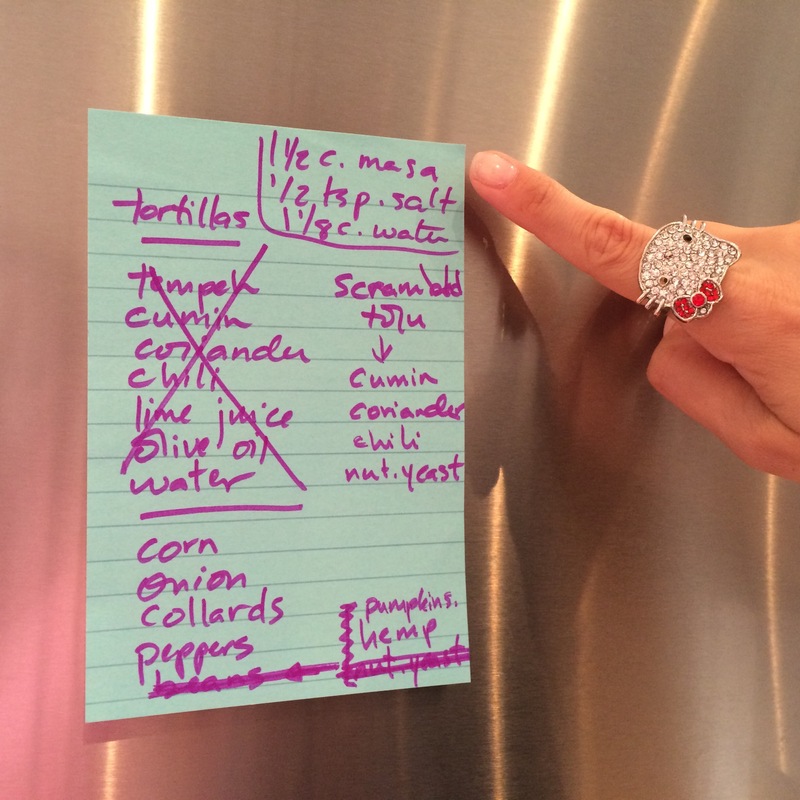 Begin by boiling a pot of water for the corn. 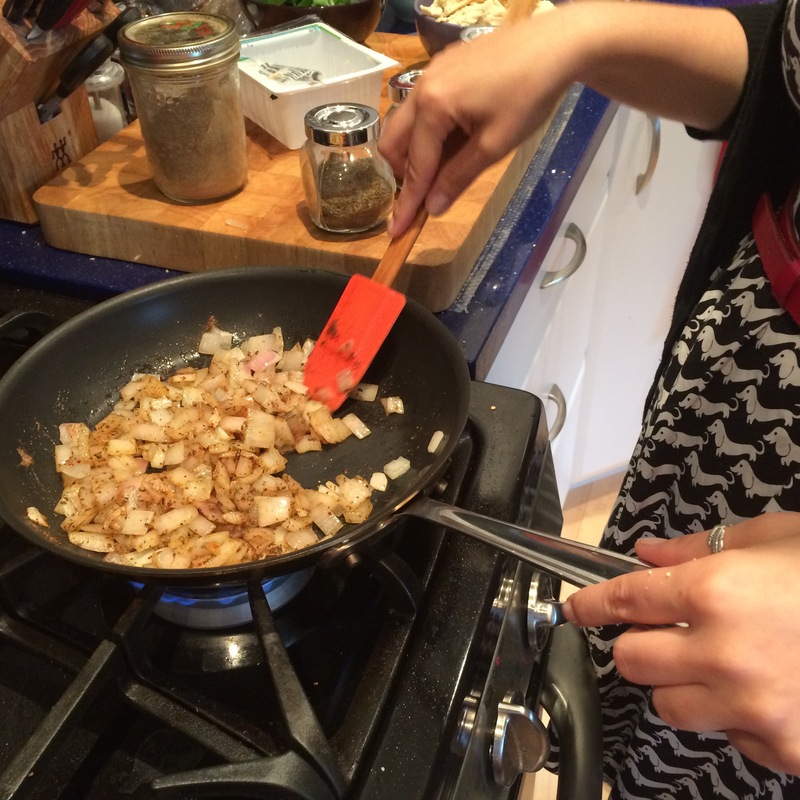 Then start on the Tofu Scramble: Heat the oil in a large non-stick pan over low heat. Add the onions and sweat until translucent. Add the spices (cumin, coriander, oregano, chili powder), and stir with a heat-resistant spatula or wooden spoon to coat the onions. Squeeze the block of tofu over the sink, to remove some of the moisture. Crumble it into the pan, and add the the nutritional yeast, salt, and water. Turn the heat up to medium-high, and cook for 5 minutes, stirring occasionally. Add the corn cobs to the pot of boiling water, and cook for 5 minutes, or until the corn kernels are tender. Remove the corn from the pot, and cut the kernels off the cob with a sharp knife. Add the chopped collard greens to the pan of tofu scramble, and cook for 5 minutes more, until the collards are wilted but still bright green. Add the corn, and stir to combine everything. 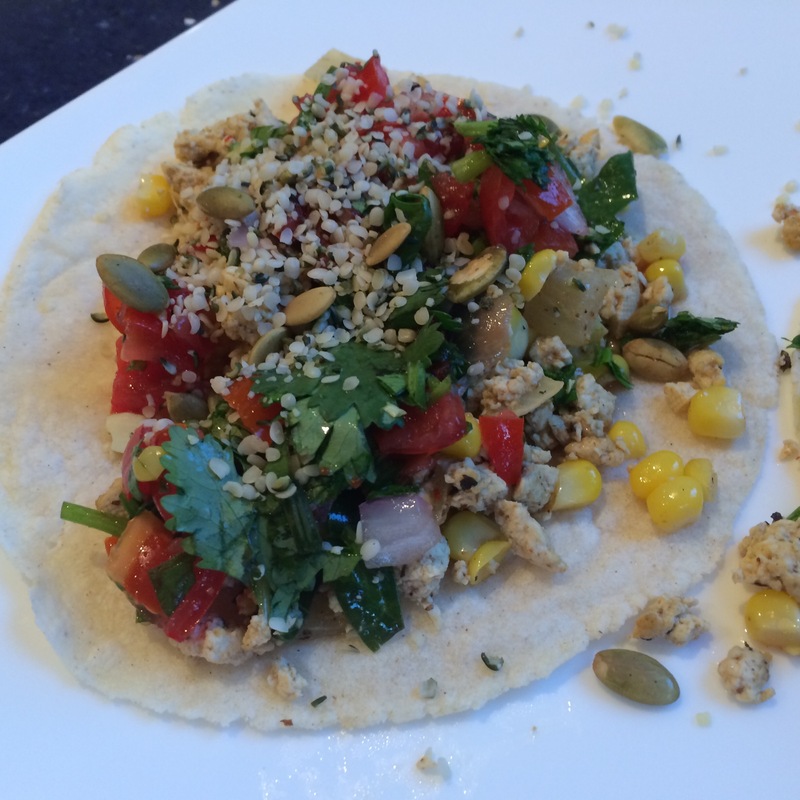 Assemble your tacos: Lay out your tortillas, and top them with a large spoonful of the tofu scramble/veggie mixture. Top with salsa, and sprinkle with pumpkin and hemp seeds. 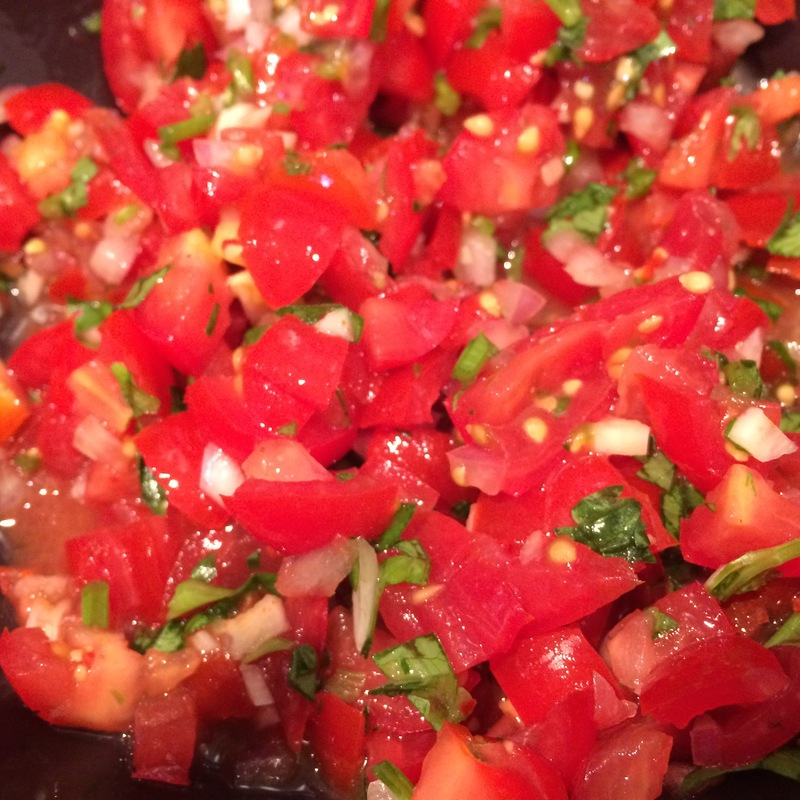 I’ve made a number of fresh salsas before, but never fresh tomato salsa! I’ve used roasted tomatillos & tomatoes, fresh bell peppers, fresh nectarines, fresh mangoes, and even chickpeas… but never fresh tomatoes. It was definitely past due! Fresh salsa can be more watery than store-bought — feel free to drain your salsa, or just stir the extra liquid back in. 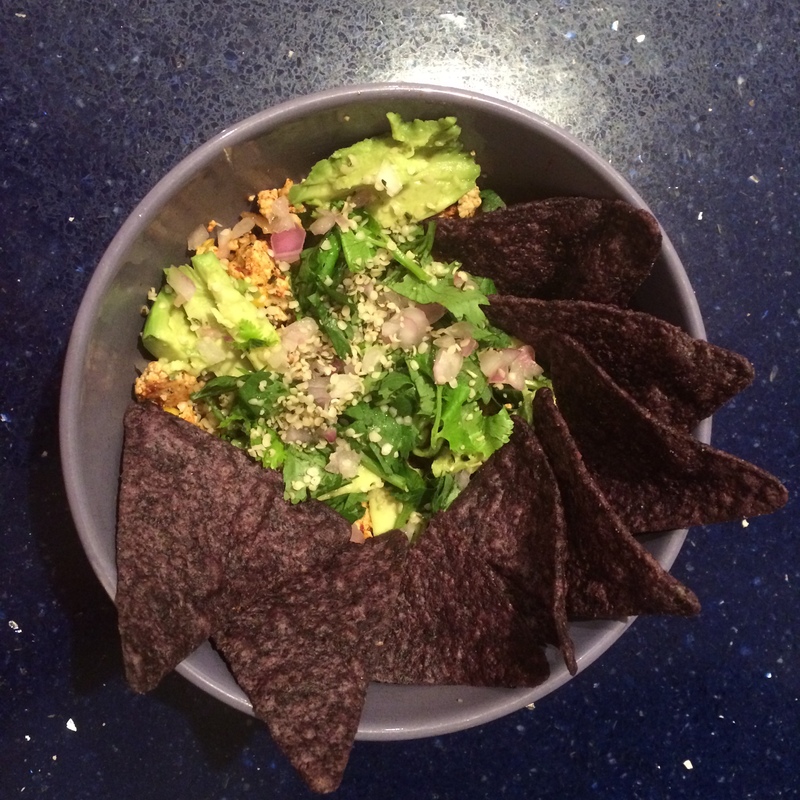 Combine all ingredients in a bowl, mix well, and eat with delight. Those tacos look amazing! I love big, savory breakfasts, and this one is just perfect. Looking forward to what else you come up with this month! I love savoury breakfast too, and this REALLY hit the spot! I’ve been LOVING savory breakfasts of late, which is why scrambled tofu is such a yummy option! I want to eat this all over again. My friend Karen came over to the house today and announced she was excited to make these breakfast tacos. Since she mentioned them, I’ve wanted to eat them all over again too! Yay for vegan brekkie tacos and the name ‘Pac-Man’ is cute! That looks absolutely delicious…so glad your hubb loves them!